Calpe, Spain - It was a long chilly day in Calpe, Spain at the XII International Women's Match Race Criterium. We started the day a bit slow, but rallied back, to finish the day 3-3. We won all of our pre-starts today, but one silly mistake per race cost us a lot. The disappointing part of the day was that they were big mistakes, but we learned from them, and hopefully will take the lessons learned forward. We had good races though, and we are learning the boats. There is quite a bit of difference between the Elliots we usually race and these boats, which made us a bit nervous in the beginning. 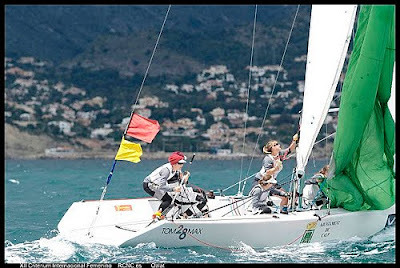 But, now we are quite comfortable in controlling them and can focus our attention on the tactics of sailing. The team did a great job, and by the end of sailing today, had figured out the communication, the boat handling and the speed of the boat. The forecast for tomorrow is for slightly less breeze than today's 8-11kts, but the sun is expected to be out which will make for warmer conditions hopefully. 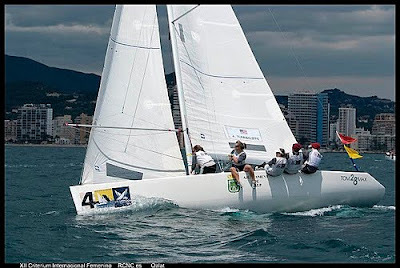 We would like to thank our sponosors Carmeuse and Trinity Yachts for their continued support of our campaign for the 2012 Olympics in London. We would also like to thank USSTAG for their support.